Here is the astonishing true story of Ruth Harkness, the Manhattan bohemian socialite who, against all but impossible odds, trekked to Tibet in 1936 to capture the most mysterious animal of the day: a bear that had for countless centuries lived in secret in the labyrinth of lonely cold mountains. In The Lady and the Panda, Vicki Constantine Croke gives us the remarkable account of Ruth Harkness and her extraordinary journey, and restores Harkness to her rightful place along with Sacajawea, Nellie Bly, and Amelia Earhart as one of the great woman adventurers of all time. Ruth was the toast of 1930s New York, a dress designer newly married to a wealthy adventurer, Bill Harkness. 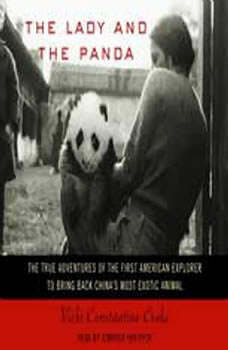 Just weeks after their wedding, however, Bill decamped for China in hopes of becoming the first Westerner to capture a giant panda–an expedition on which many had embarked and failed miserably. Bill was also to fail in his quest, dying horribly alone in China and leaving his widow heartbroken and adrift. And so Ruth made the fateful decision to adopt her husband’s dream as her own and set off on the adventure of a lifetime. It was not easy. Indeed, everything was against Ruth Harkness. In decadent Shanghai, the exclusive fraternity of white male explorers patronized her, scorned her, and joked about her softness, her lack of experience and money. But Ruth ignored them, organizing, outfitting, and leading a bare-bones campaign into the majestic but treacherous hinterlands where China borders Tibet. As her partner she chose Quentin Young, a twenty-two-year-old Chinese explorer as unconventional as she was, who would join her in a romance as torrid as it was taboo. Traveling across some of the toughest terrain in the world–nearly impenetrable bamboo forests, slick and perilous mountain slopes, and boulder-strewn passages–the team raced against a traitorous rival, and was constantly threatened by hordes of bandits and hostile natives. The voyage took months to complete and cost Ruth everything she had. But when, almost miraculously, she returned from her journey with a baby panda named Su Lin in her arms, the story became an international sensation and made the front pages of newspapers around the world. No animal in history had gotten such attention. And Ruth Harkness became a hero. Drawing extensively on American and Chinese sources, including diaries, scores of interviews, and previously unseen intimate letters from Ruth Harkness, Vicki Constantine Croke has fashioned a captivating and richly textured narrative about a woman ahead of her time. Part Myrna Loy, part Jane Goodall, by turns wisecracking and poetic, practical and spiritual, Ruth Harkness is a trailblazing figure. And her story makes for an unforgettable, deeply moving adventure. One of the world's fifty living autistic savants is the first and only to tell his compelling and inspiring life story—and explain how his incredible mind works. Maybe it was the abridgement, but this was boring, all about the socialite, not the bears. Details of the actual Pandahunting was literally nonexistant, and descriptions of capturing the bears takes about two paragraphs, as the heroine was sitting in a castle somewhere else letting others do the hunt. We know at length what she ate, who she slept with, but not how they acquired the bears. Not much adventure here.